Serving abroad changes lives, but they change in unexpected ways. I believe while I am serving abroad, I am not changing lives, but rather they are changing mine. Though my personal experiences with Oilers Serving Abroad and Manna Project International, my life as a timid, young college freshman has transformed into a confident, mature graduate student looking for more growth opportunities and stepping out of my comfort zone in any way I can. Oilers Serving Abroad (OSA) is a student lead service abroad organization at the University of Findlay. 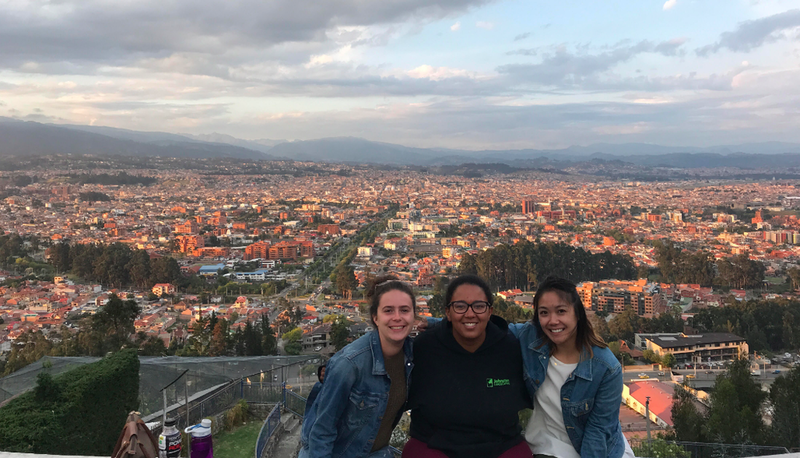 Our mission statement is: “To provide opportunities for Oilers of diverse disciplines to serve our global community, learn about culture, establish relationships, and enrich our lives.” Last spring break, OSA decided to expand our program and partner with Manna Project International in Ecuador. This expansion was exciting, but also nerve wrecking. Would this new program meet our expectations? The answer was YES! Spring Break 2019 was our first official program and we are excited to continue the relationship with Manna Project. These opportunities to serve abroad in college are eye-opening experiences that some students would never have had otherwise. Sometimes students need to take their heads out of the textbooks and truly learn and appreciate diversity and culture. Traveling is the best way to do that. It’s the best way to breakdown stereotypes and barriers. “Be the Change you want to see in the world” is a famous quote by Ghandi. Sometimes, the first step in being the change is experiencing change. Opening your mind and eyes to new experiences, new hardships, and new relationships is important. Manna Project International and their holistic approach to service, showed me and my group of students that service is so much more than donating money or doing physical labor. Service and Leadership have many definitions. Service can be as simple as a smile or a listening ear. Service can be investing in the local economy by visiting local markets, and all forms of service can be meaningful. We had the opportunity to volunteer at a local pre-school, a sustainable gardening project and a special needs school, while also volunteering at the community center in the afternoons. The diverse options for service helped expand our service definitions. But most importantly service requires relationships. Without people, there would be no one to serve and no one to do the serving. By listening to the community and creating a lasting relationship at the community center, Manna is making a difference, and I am proud to be a part of it. The biggest eye-opening experience to me last week, was creating a new definition of leadership. The amazing Program Directors at Manna Ecuador, specifically Gaby and Kate, and the Ecuador Country Director, Deborah, helped us realize that leading does not mean having all the answers, but having a plan. It also means being flexible and positive if an activity does not go as planned. Being a leader is not about bossing people around, it’s all about listening and leading by example. I felt as a leader of Oilers Serving Abroad, my own definition of leadership was changed, and I will always appreciate Manna for helping me grow and expand my mind. 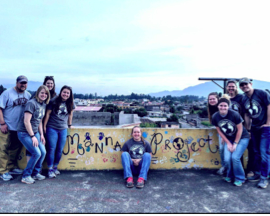 Manna Project International in Ecuador is an amazing program with diverse service learning and eye-opening experiences. It helps students change their perspectives. Most of my program consisted of graduate Physical Therapy or Occupational Therapy students, so teaching English classes or assisting in cooking classes and the general language barrier, was not exactly in our comfort zones. We knew that the Nicaragua Site was more medical based, but by choosing to volunteer with Manna in Ecuador, we pushed beyond our comfort zones and grew. This type of growth is vital for any major and any profession and will certainly help us as future healthcare professions. Gaige Rassman, Graduate Student in the Doctorate of Physical Therapy Program. Adrian Ewald, Graduate Student in the Doctorate of Physical Therapy Program. Jenna Bullock, Graduate Student in the Doctorate of Physical Therapy Program. Gabi Lamb, Graduate Student in the Masters of Occupational Therapy Program. Being part of the Oilers Serving Abroad family and expanding that family to Manna Project International was a great decision and I cannot wait for more students to get involved. Ecuador has a wonderful and welcoming culture that we can learn a lot from. I hope everyone gets the chance to go abroad and learn about another culture and learn about themselves along the way. As a 5 month PD, I was extremely overwhelmed when I arrived to Ecuador. This is because I quickly learned that there is a LOT to do here, and I only had a very limited amount of time in which I could do it all! To help deal with the panic, the other PDs and I made a “Bucket List” of all the things we wanted to accomplish over 5 months. The list has almost 30 items on it; most of which we have accomplished! Below is an abbreviated version of some of the highlights of my time in Ecuador. One thing that was very important to us was that we make time to explore the nearest big city and the capital of Ecuador, Quito. We live about 40 minutes from Quito by bus so we visit it usually at least once a week. Some of our favorite spots include: La Calle Ronda, a beautiful colonial street that hosts many traditional Ecuadorian restaurants; El Centro Historico, home to many beautiful churches and museums- we even got a chance to tour El Palacio Presidencial (the president's home)! ; and El Panecillo, a tall hill that overlooks Quito and has a beautiful statue of the Virgin Mary. At this time of year, the Panecillo is especially gorgeous because it has the largest Nativity scene in Latin America. I have completely fallen in love with the city of Quito and I am really going to miss it when I return home! This goal was the easiest on the list to accomplish because we are constantly surrounded by Ecuadorian food. Whether it is going for a quick $3 almuerzo (lunch) after our Tuesday morning meetings or grabbing hornado from our vecina (neighbor) after our Saturday morning classes, my fellow PDs and I are always eating Ecuadorian food. When I think of all the things in Ecuador, food is one of the things that I will miss the most. Hornado is definitely my favorite- it is a roasted pork dish that is usually served with tortilla (fried cheesy potatoes), mote (corn), and tomatoes and onions. When I eat hornado, I drown it in aji (a spicy sauce) because it is my favorite and I put it on almost everything. Our veci near the community center definitely makes the best hornado in Ecuador, which is a little bit too convenient for us. Jen and I (both from Massachusetts) have been trying to convince our veci to move home with us so we will not have to live without her delicious hornado. Baños was the first trip that all of the current Ecuador PDs took together. We were completely blown away by the beauty of the city; it was surrounded by beautiful mountains and waterfalls. We also enjoyed the many adventure sports offered in Baños. We went zip-lining and even swung on the swing “at the end of the world”. Otavalo is a city in Ecuador not too far from where we live that is known for its artesanal markets. So of course, I completely splurged and bought myself a ton of clothes with Ecuadorian patterns, including a beautiful alpaca sweater. I`m going to come home with a completely different style! Otavalo is also known for its fritada, which is a dish very similar to hornado except it contains fried pork rather than roasted pork. We also visited a local lake- el lago San Paolo- while we were in Otavalo and took a beautiful boat ride. When I arrived in Ecuador, many Ecuadorians suggested that I visit Cuenca, which is considered the most beautiful city in Ecuador. Although I think I prefer my “hometown” of Quito, Cuenca is undoubtedly a gorgeous city. My fellow PDs and I really enjoyed wandering its beautiful streets and taking in the sights. Cuenca is also the city in Ecuador with the most immigrants so we were able to have some authentic Italian and Indian food! One thing that was very important to us while we were making this list was that it included every region of Ecuador: the sierra (where we live), the coast, the jungle, and the Galapagos islands. Salinas is a city located on the coast of Ecuador and it is absolutely beautiful. We spent our long weekend there relaxing on the beach and taking in the beautiful ocean views. Brenna and I were even brave enough to go jet skiing on the ocean! Cuyabeno is in the Amazonian jungle region of Ecuador. It is so far off the grid that we had to take a bus ride and then a 2 hour canoe ride to get there! Highs of our trip include swimming in the river, fishing for piranhas, nighttime crocodile hunting, and getting to practice our Spanish with our lovely Ecuadorian tour guide, Charbel. Lows of the trip were finding a frog in our toilet and spotting a tarantula during one of our hikes. 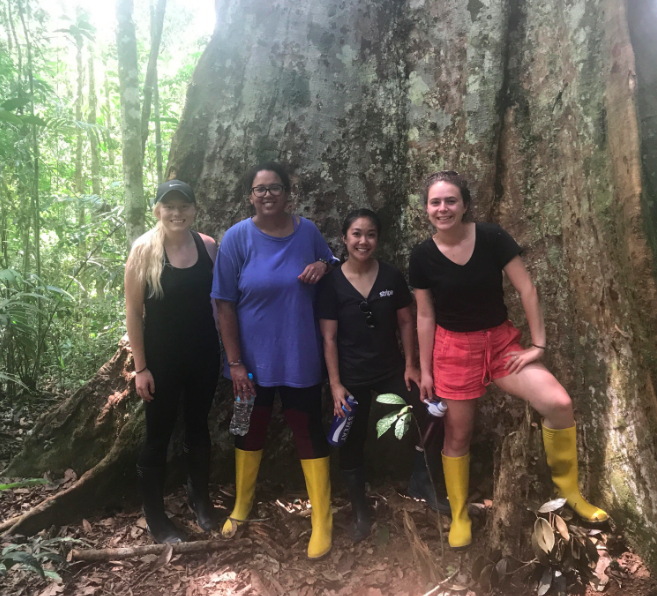 Although we had some startling experiences, we were so grateful to have the opportunity to be in such close contact with the beautiful rainforest. 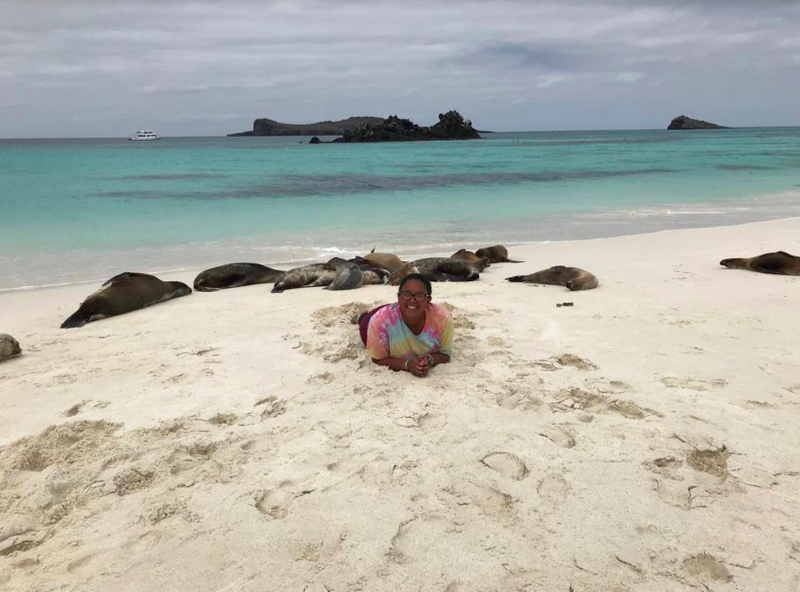 Although Jen was able to go visit the Galapagos in August, the rest of us PDs have a 5 day trip planned to visit them over our Christmas break! We are so excited to see all the biodiversity the islands have to offer and also to see our final region of Ecuador! ﻿I said that the food in Ecuador is “one of” the things I will miss the most from Ecuador but the people I have met through this experience definitively are what I will miss the most. I have been so fortunate to be able to work with Manna´s wonderful staff who have supported me through all the ups and downs of working and living abroad. I also have been incredibly lucky to be able to serve such a welcoming and friendly community. For the past 5 months that I have lived here, Ecuador has felt like my home and that is 100% because of the people I have been surrounded by. First a little bit about me: My name is Tori and I am currently a five month Program Director at Manna’s Ecuador site. When I was thinking about joining Manna Project last March, I was very nervous about what my five months in Ecuador would have in store for me. I hope that you will find my list helpful if you are interested in becoming a Program Director. To learn more about the role of Program Director, please visit this site: http://www.mannaproject.org/program-director/. Working in a foreign country and Immersing yourself in another culture is very different from working in the United States. If you come in with the same expectations, you may find yourself disappointed. For example, in Ecuadorian culture, punctuality is not as emphasized as it is in an American workplace. As a part of my job, I teach English classes and oftentimes my students will stroll up to my class half-an-hour late. Sometimes, the American in me gets frustrated with this and I interpret their tardiness as a sign that they don’t respect me and the work I put in to prepare for class. But then I take a step back and remember that their culture and upbringing is not the same as mine and that it is unfair to judge them based on my cultural values. Instead, I have learned to adjust my lesson plans to anticipate that some of my students may arrive late. I now start every class with review material so my late-comers won’t miss any new material. Working with an open mind ensures that my students do the best they can in my class! Food is something that is very important to me and I view the opportunity to work abroad as an opportunity to try new and exciting foods! Sometimes other cultures eat things that may seem unappetizing to the American eater. For example, a very popular Ecuadorian dish is called cuy, or in English, guinea pig. I tried cuy and it wasn’t my favorite. It is a very gamey meat so I probably wouldn’t order it again. However, I was glad that I was brave enough to try an authentic dish that so many Ecuadorians adore. A more successful example would be when I tried pescado encocado, a very popular dish on the coast of Ecuador. It consists of a fillet of fish with a sauce made from coconut milk. I had never tried anything like that in the US so I wasn’t sure if I would like it, but from the first taste I knew it was the right choice! It was absolutely delicious- everyone at my table had food envy! For this exact reason, I always think it’s helpful to come to another country with an open stomach- you never know what foods you might discover! Homesickness is almost inevitable when living abroad and I think it is important to be prepared for when it hits. One way to battle homesickness is to maintain hobbies or activities that are part of your regular schedule in the United States. When my head is spinning from too much Spanish and I am craving some good old Vermont cheddar (the cheese in Ecuador is a huge disappointment to me and a common source of homesickness), I like to have some alone time in my room and watch American shows on Netflix. For the hour I am watching Desperate Housewives (they have it on Netflix here! ), I am able to forget about the stresses of being away from my home and culture. That type of mental break is essential to combating homesickness when it strikes. Netflix is my “something from home.” For other Program Directors, they continue their home workout routines, read books in English, or practice yoga. I think the key is to identify what your “thing” will be before you come to your new country, and then make sure that you have the things you need to continue your hobby. This item is something I wish I had thought more about before coming to Ecuador. The more you know about the country you are going to, the easier it will be to adapt to that culture. Arriving in a new environment can be overwhelming; there are a lot of differences to process. For me, since I am only living in Ecuador for five months, I have found myself very stressed out about all the things I need to do and see before I come home. I think if I had done more research about Ecuador before I arrived, I could have hit the ground running when I got here, which would have relieved some of that stress. Another preparation I would suggest would be to practice your Spanish! No matter your speaking level, I think it never hurts to get some practice in before you immerse yourself in a different language! Whether it means playing basic games on Duolingo or practicing speaking on a language exchange app, Spanish practice will make everyday activities, like ordering coffee or trying to find a public bathroom, significantly easier! I know that immersing yourself in a new culture can be a bit scary, but ultimately becoming a Program Director is the opportunity of a lifetime! I’m only three months into my experience and I have already learned so much. I know I will go back to the United States with memories and friendships I will cherish forever! During my time in Ecuador, I have visited amazing places, viewed breathtaking sights, tried many delicious foods, and made so many wonderful memories. But what I will remember the most about my time here is not the walks around Historical Quito, not drinking homemade juice with every meal, but the immensely warm and friendly people I have met here. During orientation, Carolyn warned us that the Serrano people have a reputation for being shy and quiet. A backpacker I met while hiking Quilotoa went as far as to say Ecuadorians were rude. My experience could not be further from this. There are countless people who have shaped my experience, but I want to thank the following people especially for their kindness and influence. Thank you to Alexandra, a key Manna Project member and the first Ecuadorian I had a full conversation in Spanish with. I appreciate you taking the time to listen and attempt to understand by broken and mangled Spanish, and giving me the confidence to practice speaking despite my many, many, mistakes. From basic niceties to not quite G rated slang, you provided me with a unique glimpse into the Spanish language I most definitely would not have received in a classroom. Your patience and encouragement meant so much to me in my first days in Ecuador. Thank you to Sra. Erika Carrera, the teacher I helped at the local university, for your incredible generosity and energy. I did not expect to an hour long going away party complete with live entertainment, food, and a magician after volunteering for only 3 weeks, but if I have learned one thing about this country, it is that it never ceases to surprise you. Each time I walked into your classroom, I knew the next two hours would be full of laughter and learning, for both your students and myself. I answered their questions and they answered mine. Your classroom provided an atmosphere of mutual cooperation and respect that allowed curiosity to become authentic learning. I smiled every moment of your class, and can not imagine my experience without ESPE. Thank you to Felipe, one of the most exuberant and affectionate people I have met, and my favorite student from Antorcha de Vida. Your constant joy brightens everyone's day, and was much needed on our occasional two mile shadeless strolls on hot days. I have never seen a bigger, more radiant, more heartwarming smile on a person’s face so often. Thank you for reminding me to always keep a positive attitude, no matter what the circumstances are. Finally thank you to everyone in Manna for making this experience so warm and friendly and great. When I boarded my flight to Quito, I was very worried about living in a foreign country where I did not know a single person for an entire month. The Program Directors and my fellow interns formed such a happy and supportive community within so little time, and this was a huge comfort when faced with the obstacles of working in a non profit organization in a Spanish speaking community. I could never imagine that living in a house with 12 other people could be tolerable, not to mention enjoyable. I will remember and cherish the strong sense of community fostered by our group for a very long time. Megan was a first session 4 week intern with Manna Project. Our summer internship positions offer both 4 and 8 week positions, while our long-term volunteer positions are for 13, 5, 7, or 12 months. Apply to volunteer with MPI Ecuador to change your life! I left Chicago O’Hare to travel to Ecuador feeling extremely excited, but also with the knowledge that I would be taking each and every part of my trip as it came. A month before the trip, I had no inclination that I would be flying down to South America; I was initially accepted into the Manna Project International summer intern program in Nicaragua, but a series of violent protests sparked by pension law changes tossed a wrench into my plans. Manna operates two sites, one in Nicaragua and one in Ecuador; when it was announced that the Nicaragua site would be canceled for the first session, I worked with the Manna staff and my parents to shift my plans for Ecuador. I wanted to work with Manna in any capacity because it offered several facets that aligned with my academic and personal passions. Most importantly, I am very interested in international community development, having studied it in courses at Vanderbilt such as Latin American Economic Development. Manna operates an effective approach to international community development by partnering with local organizations to provide a holistic development approach to community members. International development can be a difficult task laden with problematic approaches that resemble voluntourism, or the white-savior complex; Manna’s programs start by listening and getting to know the communities they serve, then aligning resources to meet the demonstrated needs. Manna offers the chance to have my feet on the ground, engaging and serving communities in Ecuador, while at the same time learning about a successful international development model. Since arriving in Ecuador and experiencing the first week of service, I have already had done things very differently than my normal modus operandi back home. One big difference for me: riding the bus. Ecuador has a well-utilized bus system, and I am still nailing down the names of the different buses (Cia Azblan, Libertadores, Los Chillos, Amaguaña, etc.) and the different routes (Conocoto, Rumiloma, La Salle, El Triángulo). I learned that on each bus, rather than having an automated system like buses I am accustomed to in the U.S. there is an “ayudante”, a man or woman who comes up to each passenger and asks for the bus fare. The fare is typically anywhere from 25-35 cents, so I now carry much more change in coins than I ever have. An interesting facet of Ecuadorian bus culture that I have begun to practice myself: although Ecuadorians tend to be very welcoming people, they remove to move from aisle seats to window seats on buses. Any on-boarding bus passenger who spots an open seat is forced to squeeze past the aisle seat passenger, whereas in the U.S. typically the person would just move over. After having squeezed uncomfortably passed a number of people, I myself have started occupying the aisle seat and insisting that people budge past me. Another hallmark experience from my first week was a community “almuerzo” [lunch] that I was invited to alongside our program directors. One of the women in the level 2 English class beckoned us to come to her family’s house for Ceviche, a traditionally prepared coastal Ecuadorian dish. When we got there, we had a long chat with her husband, who is a serviceman in the Ecuadorian military. Then, we sat down to Ceviche. It was a cold fish soup, prepared with shrimp, tomatoes, lemon juice, cilantro, and a few other ingredients. As is often custom, there were bowls of tostada, popcorn, and chifles [plantain chips], and we were instructed to add some of these other items to the soup. My first bowl was good; I enjoyed pairing the warm tostada with the cold, zesty shrimp soup, and I ate the whole bowl. However, the texture was very different, and honestly I still don’t know how I feel about cold soup. She refilled my bowl and I struggled through the second helping, finishing it not out of a strong taste for the Ceviche, but to satisfy our gracious host. Looking forward to the rest of the program, I hope to focus on 3 objectives: utilizing my Spanish, making a strong sustainable impact on the community and its programs, and forging strong relationships with the rest of my cohort. I have been listening to Spanish music and starting conversations with anyone who will talk with me, and I plan to prepare extensively for the English classes and other initiatives I am involved in so that I can contribute positively to Manna’s work. Finally, through bus rides and community dinners, I have already had a chance to form bonds with the other interns, and as we serve, learn, and experience Ecuador together, I know those bonds will only deepen and grow.